Your pizza wish will soon be granted. Pizza Ranch is coming to Duluth. We posted an article on Monday regarding the possibility of Pizza Ranch opening within Duluth. At that point in time the news was based off various sources including those from Pizza Ranch restaurants themselves. It was pretty clear though that there was quite a bit of talk going on regarding Pizza Ranch and Duluth... yet there was no official announcement. We received confirmation from Pizza Ranch officials this week that Duluth is in fact on the list for a new location, actually at the very top of the list. While an exact opening date has yet to be determined it is expected that the location will open this fall representatives told us. The company has yet to release the exact location of where the Duluth Pizza Ranch will be however we feel pretty safe to say that it will be in the former Party America location pictured above at the Stone Ridge Shopping Center. It's the location where we have heard countless sources explain to us that Pizza Ranch is opening up shop and those sources include some Pizza Ranch servers themselves. An extensive renovation will need to take place both on the exterior and interior in order to ready the space for Pizza Ranch. Work on adding and relocating utilities has already been said to have begun on the interior. News of Pizza Ranch's first Twin Ports location comes on the heels of the opening of Pizza Hut's second Duluth restaurant at the Shops of BlueStone. Pizza Hut is making it's entry back into the Twin Port's market after having a single store for nearly a year. The new store within the Shops at BlueStone's recently completed third phase is located at the corner of Woodland Avenue and Clover Street. Another location is planned for a former Pizza Hut space at the corner of Central Avenue and Grand Avenue in West Duluth. It is expected to open next month. Pizza Hut use to have four Twin Ports locations but in 2014 two of the four closed due to issues with the franchise agreement ( a third in Superior closed to make way for a Kwik Trip location). The company's location at BlueStone is expected to be a replacement for the former location on London Road. The Shops at BlueStone and Grand Avenue locations are not expected to be the last additions for Pizza Hut within the Twin Ports. Sources within the past few months have been stating that Pizza Hut is planning to replace their Central Entrance location with a new location in a planned retail center on site. The new location would feature the company's new sports bar prototype, a concept that made its debut in St. Cloud last year and more recently in Downtown Minneapolis this past summer. The Shops at BlueStone Pizza Hut location also features the company's WingStreet concept. WingStreet serves three different wing types covered in one of 12 different sauces or four different dry rubs. The concept is also known for their seasoned fries. The Grand Avenue location will also be dual branded as Pizza Hut | WingStreet location when it opens next month. Could Pizza Ranch soon make Duluth home? Pizza Ranch. You say those two words and some people begin to start twirling in circles like a dog waiting for a treat. People absolutely love the fast growing casual pizza chain that is sweeping the nation by storm. Yet even with such aggressive plans... there has yet to be a Duluth location. Well, that could soon be about to change. We've had a few tips recently stating that Pizza Ranch has in fact put Duluth on their expansion plans. In fact the new location is expected to open before years end. 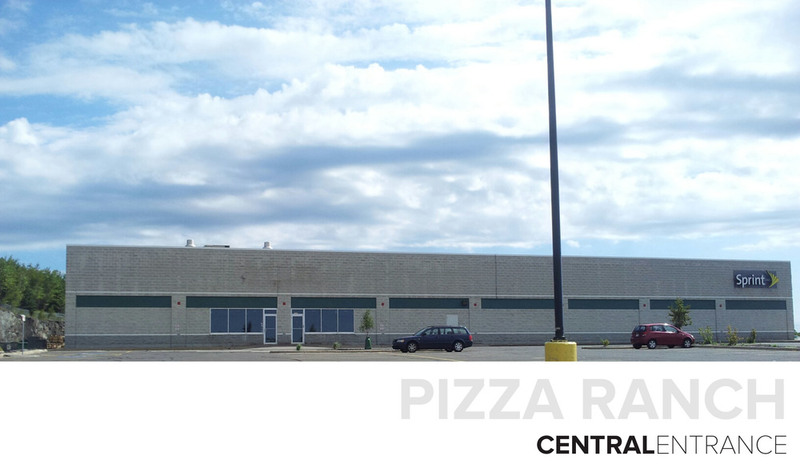 A Pizza Ranch representative at a store location within Minnesota stated that Duluth's location is planned for the former Party America space at 1025 West Central Entrance in the Stone Ridge Shopping Center near the Miller Hill Mall. The space is tucked behind Sprint and Catherine's and has been vacant for a number of months now. Well, if you're unfamiliar to the Pizza Ranch concept then let us fill you in before we spill the rest of our details. Pizza Ranch opened the doors to their first location in Hull, Iowa in 1981. Since then the company has expanded to over 180 locations within the Midwest and West. In the Midwest it actually is the largest regional franchise pizza company around. The company is largely Christian based with a goal "to glorify God by positively impacting the world we live in." The restaurant is well known for their wide variety of menu items including their many pizza options, chicken options, and a salad bar. During certain times of the day there also is a pizza buffet available to diners. We've also heard the dessert pizzas are quite delicious. This wouldn't be the first time that Pizza Ranch has set their sights on Duluth, oh no. About six years ago the company planned to locate within the Maple Square retail center in Duluth across from the Burning Tree Plaza. The space they were to occupy would have been most of the second floor next to Nevada Bob's Golf. Plans for that site however never came to fruition. It was however always clear that the company still intended to open a restaurant (or a few) within the Twin Ports. The question at that point in time turned into "when?" It might have been that first mention of a Pizza Ranch coming to Duluth that caused locals to begin petitioning for a Duluth location. If you check out the company's facebook page today you can see numerous mentions of people requesting a Duluth location in their comments feed. Currently we are waiting on details (mostly a confirmation) from Pizza Ranch's corporate office about the potential Duluth restaurant. Sources state that work has already begun on the utilities portion for the new Duluth restaurant and that an opening is still planned for this Winter. You know the drill. Once we find out more details we will be sure to post them right here at CDINDULUTH. Until then, check out our other articles about all the great development occurring in the Twin Ports under our news section. Or just click here.